Upgrading the WiFi in a large space is a big project. Upgrading the WiFi on a university’s campus is a huge project. With numerous academic and residential buildings, stadiums, and even outdoor areas, it is imperative to plan the project accordingly so as to not disrupt business, learning, and living conditions. A complete WiFi upgrade is not a simple task. It takes planning and patience. 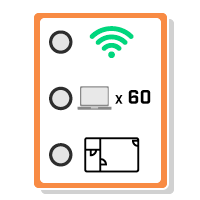 There are three main phases of a campus WiFi upgrade: design, installation, and testing.